The famed British grenadier is the iconic image of the redcoated warrior. The 35th Regiment decided to portray the Grenadier Company because these were the soldiers who saw the most hard-fought action in the American Revolution. Every regiment of foot had a grenadier company made of the best, hand-picked men. They were chosen for their experience, bravery, steadiness, and their height (the tallest men). Forage Cap - triangular style, red wool with an orange band and linen sweatband, optional "35"
Shoulder Belt - converted from waistbelts, these 2"-wide belts carried both the bayonet and the hangar (sword). Waistbelts worn over the shoulder are also acceptable. *This is documented based upon the inspection returns of the grenadier company, thanks to Hew Strachan's book British Military Uniforms 1768-1796. All other uniform and kit is the same. The image will be in compliance with deLoutherbourg's 1778 sketches of grenadiers in such attire. Buttons - if there is one thing that the 18th Century uniform has a lot of, it's buttons. Enlisted men had regimentally specific buttons made out of cast pewter. Officers had buttons silver plated. Our button is an exact copy of a 35th Regiment button now held in the New-York Historical Society. For your own uniform, buttons can be had from either Jas. Townsend & Son or Roy Najecki from Najecki.com. Be aware, however, that not all buttons are the same! The button on the left is the Coat Button. It is about an inch in diameter, slightly domed, and has an incised 35 in the center and surrounded by a "rope" pattern. 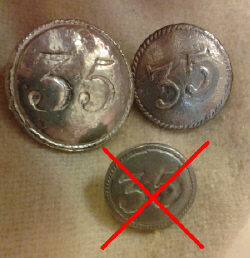 The button on the right is the slightly smaller Waistcoat Button which also has the rope pattern border, but the 35 is of a different style and is raised instead of set in. You will need about 42 Coat Buttons and 12 Waistcoat buttons for one uniform. The lower button, a smaller version of the Coat Button, is not acceptable. It's not based on anything, and yet there are some reproductions out there. Do not buy those! Choose your buttons correctly.